Homemade Instant Hot Cocoa is rich and creamy, and just as easy to make as the store-bought instant pouch—without extra sketchy ingredients. Mix things up with fun flavor add-ins! On a cold winter day, it’s only fitting to snuggle under a cozy blanket and unwind with a hot drink in hand. Even more so, if snow is on the ground. When my kids come inside after playing in the snow (pretty rare here in Virginia! 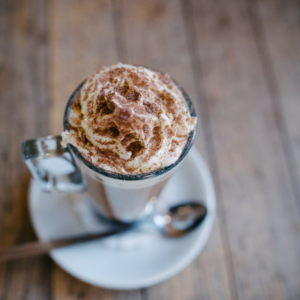 ), there are two things on my mind: hot soup and hot cocoa (preferably topped with my easy homemade whipped cream)! 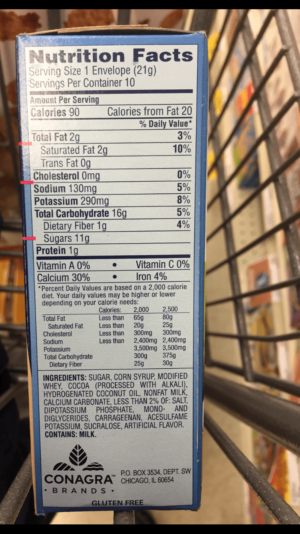 INGREDIENTS: Sugar, Corn Syrup, Modified Whey, Cocoa (Processed with Alkali), Hydrogenated Coconut Oil, Nonfat Milk, Calcium Carbonate, less than 2% of: Salt, Dipotassium Phosphate, Mono- and Diglycerides, Carrageenan, Acesulfame Potassium, Sucralose, Artificial Flavor. Contains: Milk. Did you catch that? Four different forms of sugar (two of which are the first two ingredients! ), hydrogenated fat (not too far behind), and other additives. Call me crazy…but shouldn’t delicious cocoa need no more than milk (or water), cocoa, and ONE sweetener?? Don’t get me wrong—I grew up on Swiss Miss. But in more recent years, I’ve quickly learned about refined sugars and their (not so good) effects on your body, and that is enough to make me run far away from the store-bought packets! Instead, I’ve started to mix up my own homemade cocoa, and found it to be no harder or more time consuming than the store-bought version, thanks to using the microwave. Feel free to call me a hot cocoa snob, but I also think it tastes a hundred times better than the box!! Another benefit to making homemade instant hot cocoa is that it is one less item to buy at the store. Rather than add hot chocolate pouches to my grocery list, the homemade version uses ingredients I always have in my kitchen, so we will never need to turn down the opportunity to indulge! 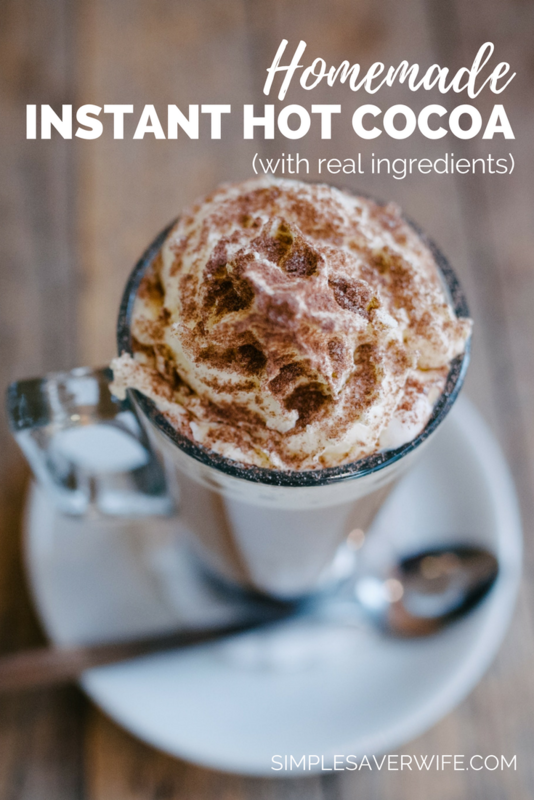 Whether you make just one cup at a time or an entire pot for a crowd, you’ll find this homemade instant hot cocoa to be a hit! Homemade Instant Hot Cocoa is rich and creamy, and just as easy to make as the store-bought instant pouch—without extra sketchy ingredients. Start with the basic recipe, and then choose a flavor add-in to mix things up! Fill your favorite mug with milk and microwave on high for 90 seconds. Add cocoa powder and sweetener of choice; stir well. Continue heating in the microwave for 30-second intervals and stirring until ingredients are completely smooth and dissolved. 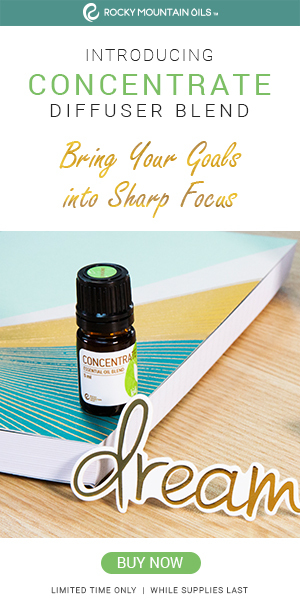 Serve as is, or choose a flavor add-in: 1 drop peppermint extract (or essential oil); 1 tsp vanilla extract; 1 dash cinnamon. Top with homemade whipped cream, and enjoy!